Bière ambrée artisanale sur lie au caractère fin et original. 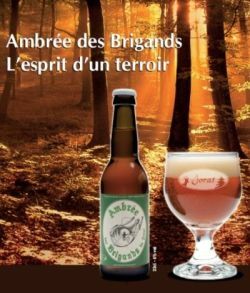 Un subtil mélange de trois malts d’orge, dont l’un fumé, embellit merveilleusement cette bière à la robe cuivrée d’un arôme particulier et unique. UPDATED: MAR 4, 2019 Biere aus der französichsprachigen Schweiz finde ich immer interessant, da sie meist einen Stich Blanche-Bier-Geschmack haben, wie er eben in Frankreich auch gerne drinnen ist. Damit wirken sie feiner und weniger plump als die deutsch geprägten Biere aus dem deutschen Teil des Landes. Dieses bernsteinfarbene Amber Ale hat das auch. Es ist ein schön malziges Ale mit einem frisch-hefigen Geschmack. Allerdings hackt es an der Harmonie zwischen den Aromen: einmal Malz, dann Hefe, dann ein bisschen Buttrigkeit -all das hindert das Bier an einer guten Bewertung. 33cl bottle from a trade with anstei, thanks! A clear amber beer with a small most good lasting off-white head. Aroma of smoked malt, bacon, red malt, caramel. Taste of mild smoked and caramelish malt, red malt, nuts, some bacon, good stuff! Pours hazy brown with a light beige head. malty nose with a bit of smoke. Taste is malt, bread, smoke, caramel and ash. Orange, small head, smoky aroma, smoked wood, bready, nice, smoky and bready flavor, a bit sweet, woody, like a steak, medium bodied. Bottle sample at a tasting at Max’ place, thanks Alexei. Hazy amber with a white head. Smoky aroma of Bisli snack and a little malty, tastes sweet and smoky. Medium body, solid carbonation, smoky-sausage finish. Bottle, sourced by Thiru in Geneva. Poured an amber brown colour with a billowing head and substantial sediment. Smokey! Sweetish, meaty smoked aromas, spicy hop. Not over smoked, which is nice. A decent one. Bottle sample at a tasting. Thanks Alexey. Hazy orange color. Aroma - clove, smoked bacon, yeast, caramel. Sweet, flavors of overripe fruit, caramel, smoked meat, bread. Medium-bodied, fizzy. A bit too heavy and sweet. At a tasting, small creamy head, slightly murky dark orange color, aroma of biscuit and not too intense smoked meat, with some caramel, flavor of caramel, smoke and biscuit, a bit too sweet. Fair but not too exciting.